Even though HTC latest and greatest creation is yet to land on store shelves, it seems like it has stirred up the modding community to the point of rooting. That’s right, this here is a tutorial in which we explain an easy and simple way for rooting the HTC One X. It is also highly possible for custom ROM’s for the One X to appear in the next couple of days, as the official firmware of the HTC smart phone has already been leaked on the internet. This means that as soon as the device is available users will be able to load it with their own custom content and improve what will surely be the first quad core Android running smart phone. Before we move on you should know a couple of very important aspects regarding rooting any Android device. Rooting your HTC One X will most likely void the warranty, so if you are uncomfortable with this, you should probably stop here. If somehow, something goes wrong, you are on your own. Neither we nor the developer of this software can be held responsible for any damage that might come to your device by following this guide. By all means, you should not be discouraged by the above statement, as everything in this article should work because HTC have not changed the lower part of the system called the bootloader. Thanks to the guys over at androidadvices for finding this procedure. The first of this tutorial consists of the steps needed before the actual flashing process. While these steps are not mandatory, we strongly advise you to follow them, as they mostly refer to backing up the information that is already on your device. This is done in order to prevent the loss of any kind of personal data if anything should go wrong. If you happen to want to root the device before personalizing it feel free to skip this part. As in any other backup procedure it is advisable not to use the official backup software that came with your device as it does not support the custom firmware files out there. There is also a big chance of it not recognizing your HTC One X after it has been rooted so please use or install the apps below to do the backup. As a general rule, none of the information stored on either the internal memory card or the external micro SD card can be affected by the rooting process. Just to be sure you should also back up this information to your PC or MAC. Charge your device to full or to a minimum of 60% to ensure that the phone will not power off during the install process. Enable the USB debugging in your HTC One X. This can be done from the following: Settings > Applications > Development > USB debugging. The USB Debugging option should be ticked. Turn Off all the antivirus as well as Firewall tools in your computer as these tools tend to interrupt the process of firmware update. The second part of this tutorial is actually the hard part, as it covers the whole flashing process. Many people tend to think that flashing your phone is a risky and dangerous business, but if done properly it actually poses less of a risk that installing an app. Gaining root access to your device also means that you will be able to back up the entire phone in a couple of clicks so that no harm can come to it from failing any other flashing procedures. This backup features comes as a big bonus for a device such as the HTC One X that lacks a memory card slot. The first step in this guide is as easy as downloading all the necessary bits and pieces of software. In order to do so you must download this Super boot zip file and then extract it afterwards. 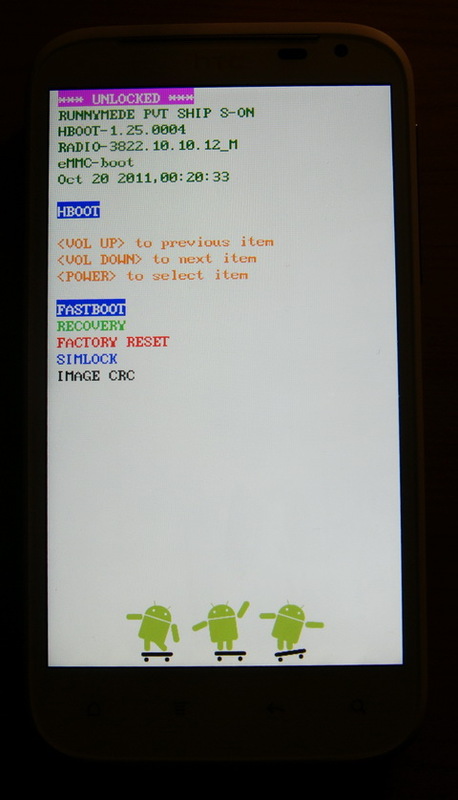 The second step is a bit trickier and it involves rebooting your HTC One X into bootloader mode. In order to do so, you must first turn off your phone and then start it up by pressing the Volume Down Key and then Power Key simultaneously. You might not get it right at first, but before going any further you need to be in this menu. It is also worth noting that after you entered this menu you should wait for a couple of seconds before pressing any other keys. The third step is also the last one and it only involves plugging your HTC One X into the computer using its original USB cable and opening the file named “install-superboot-windows” from the archive you have previously downloaded. After starting this application you will see a new command windows popping up and you can simply follow the procedure from there. It should not take very long for it to finish and when done you will be asked to unplug your HTC from the computer. If you happen to be running on a MAC, instead of simply double clicking the application you have to go from within the terminal to the folder that contains the “install-superboot-mac” file and then type the following in this order: “chmod +x install-superboot-mac.sh” “./install-superboot-mac.sh”. In the other case where you want to do this procedure and you only have a Linus running computer near you have to open the terminal and navigate to the folder you have downloaded before and then type in the following commands in this order: “chmod +x install-superboot-linux.sh” “./install-superboot-linux.sh”. When all this is done you should be happy as you have just successfully rooted your brand new HTC One X smart phone with a minimum amount of effort. From here on you should know what you need to do with your rooted device. I'm just looking to uninstall about 20-25 preloaded apps. They're taking up so much memory and I don't even use them. Will rooting work for this? Or are there newere methods sin Ew this article is over a year old? Do i have to unlock the bootloader before i do this root? hi, i have just completed the instructions exactly as stated. Its been over 10 minutes and my phone is still on the first screen. Just showing htc on the white background. Have i done something wrong?